Download "The Work-related Learning Guide First edition. 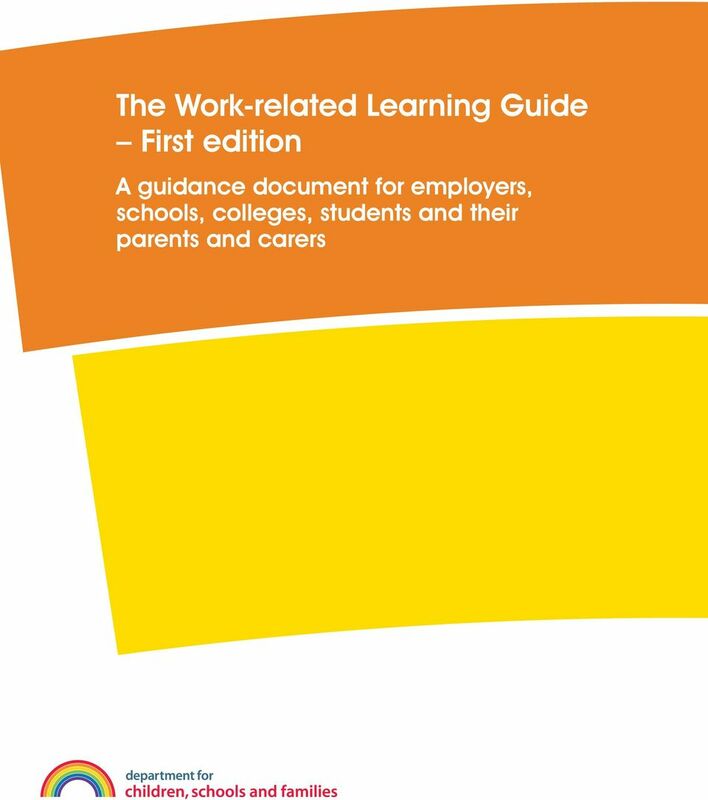 A guidance document for employers, schools, colleges, students and their parents and carers"
3 The Work-related Learning Guide The Work-related Learning Guide First edition This guide is intended to provide people with a good understanding of work-related learning. It is aimed at everyone involved young people and their parents or carers, employers, schools and colleges, and the Education Business Partnership Organisations that help to make it happen. 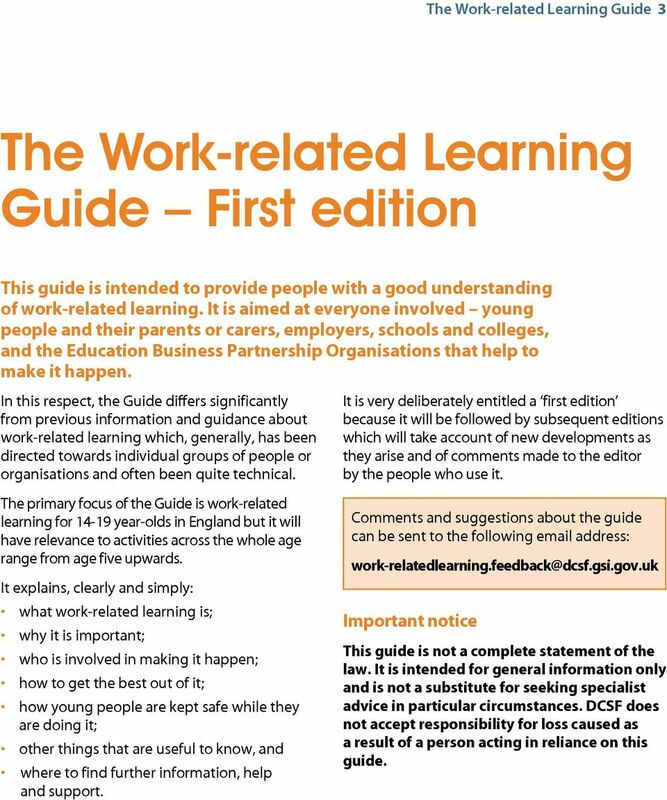 In this respect, the Guide differs significantly from previous information and guidance about work-related learning which, generally, has been directed towards individual groups of people or organisations and often been quite technical. The primary focus of the Guide is work-related learning for year-olds in England but it will have relevance to activities across the whole age range from age five upwards. It explains, clearly and simply: what work-related learning is; why it is important; who is involved in making it happen; how to get the best out of it; how young people are kept safe while they are doing it; other things that are useful to know, and where to find further information, help and support. It is very deliberately entitled a first edition because it will be followed by subsequent editions which will take account of new developments as they arise and of comments made to the editor by the people who use it. Comments and suggestions about the guide can be sent to the following address: Important notice This guide is not a complete statement of the law. It is intended for general information only and is not a substitute for seeking specialist advice in particular circumstances. DCSF does not accept responsibility for loss caused as a result of a person acting in reliance on this guide. 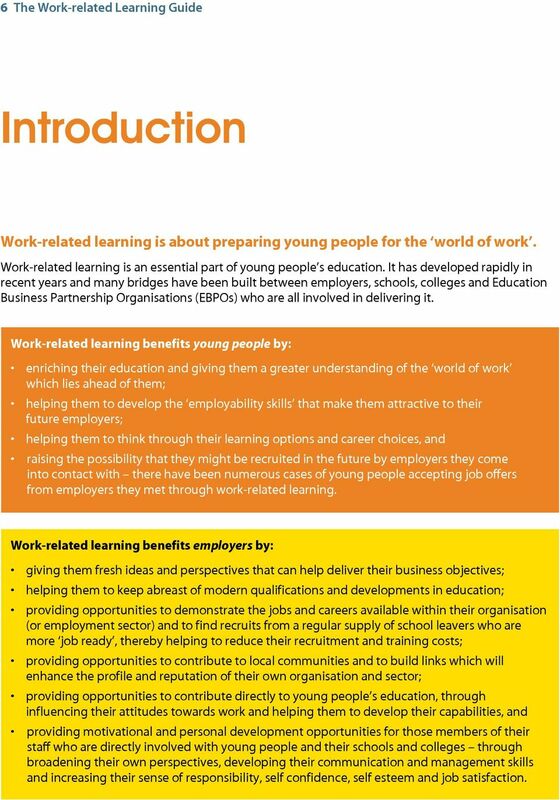 6 The Work-related Learning Guide Introduction Work-related learning is about preparing young people for the world of work. Work-related learning is an essential part of young people s education. It has developed rapidly in recent years and many bridges have been built between employers, schools, colleges and Education Business Partnership Organisations (EBPOs) who are all involved in delivering it. Work-related learning benefits young people by: enriching their education and giving them a greater understanding of the world of work which lies ahead of them; helping them to develop the employability skills that make them attractive to their future employers; helping them to think through their learning options and career choices, and raising the possibility that they might be recruited in the future by employers they come into contact with there have been numerous cases of young people accepting job offers from employers they met through work-related learning. Work-related learning benefits employers by: giving them fresh ideas and perspectives that can help deliver their business objectives; helping them to keep abreast of modern qualifications and developments in education; providing opportunities to demonstrate the jobs and careers available within their organisation (or employment sector) and to find recruits from a regular supply of school leavers who are more job ready, thereby helping to reduce their recruitment and training costs; providing opportunities to contribute to local communities and to build links which will enhance the profile and reputation of their own organisation and sector; providing opportunities to contribute directly to young people s education, through influencing their attitudes towards work and helping them to develop their capabilities, and providing motivational and personal development opportunities for those members of their staff who are directly involved with young people and their schools and colleges through broadening their own perspectives, developing their communication and management skills and increasing their sense of responsibility, self confidence, self esteem and job satisfaction. 8 The Work-related Learning Guide What is work-related learning? 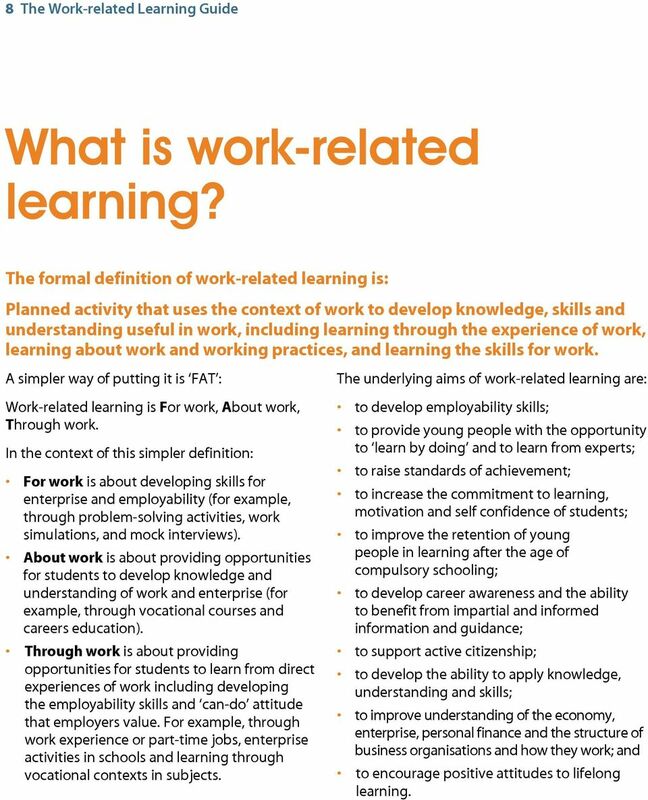 The formal definition of work-related learning is: Planned activity that uses the context of work to develop knowledge, skills and understanding useful in work, including learning through the experience of work, learning about work and working practices, and learning the skills for work. A simpler way of putting it is FAT : Work-related learning is For work, About work, Through work. In the context of this simpler definition: For work is about developing skills for enterprise and employability (for example, through problem-solving activities, work simulations, and mock interviews). About work is about providing opportunities for students to develop knowledge and understanding of work and enterprise (for example, through vocational courses and careers education). Through work is about providing opportunities for students to learn from direct experiences of work including developing the employability skills and can-do attitude that employers value. For example, through work experience or part-time jobs, enterprise activities in schools and learning through vocational contexts in subjects. The underlying aims of work-related learning are: to develop employability skills; to provide young people with the opportunity to learn by doing and to learn from experts; to raise standards of achievement; to increase the commitment to learning, motivation and self confidence of students; to improve the retention of young people in learning after the age of compulsory schooling; to develop career awareness and the ability to benefit from impartial and informed information and guidance; to support active citizenship; to develop the ability to apply knowledge, understanding and skills; to improve understanding of the economy, enterprise, personal finance and the structure of business organisations and how they work; and to encourage positive attitudes to lifelong learning. 10 10 The Work-related Learning Guide What does work-related learning look like? All students experience work-related learning at some point in their education although sometimes they might not know it! They will certainly take part in it during the last two years of their compulsory education (Key Stage 4) because it is a statutory part of the curriculum at that stage. It is also a vital component of the new Diplomas. Work-related learning is not a subject, in the same way as, say, science is. Rather, it is a way of delivering learning. Many people think of it as just the one or two week work experience placement, but it is much broader range of activities than that. So much so that young people, employers, schools and colleges are always able to find one or more opportunities which appeal to them. For some students, work-related learning is built into the subjects they are studying and supplemented with additional careers education and work experience. For others, it is distinct element of their learning, for example in the new Diplomas, leading to an applied qualification. 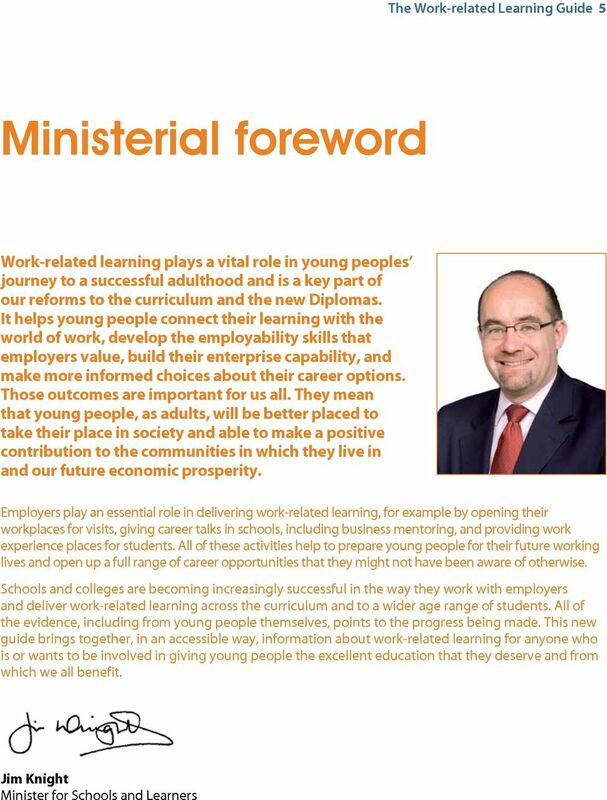 Work-related learning as part of Diplomas The Diploma is a new qualification which will enable 14 to 19 year olds to progress into employment as well as into college and university. It is designed to provide an excellent learning experience for young people and best meet their needs. The Diploma is an integrated course of study that will allow students to apply their learning in a practical and relevant way and make decisions about what kind of work they want to do. 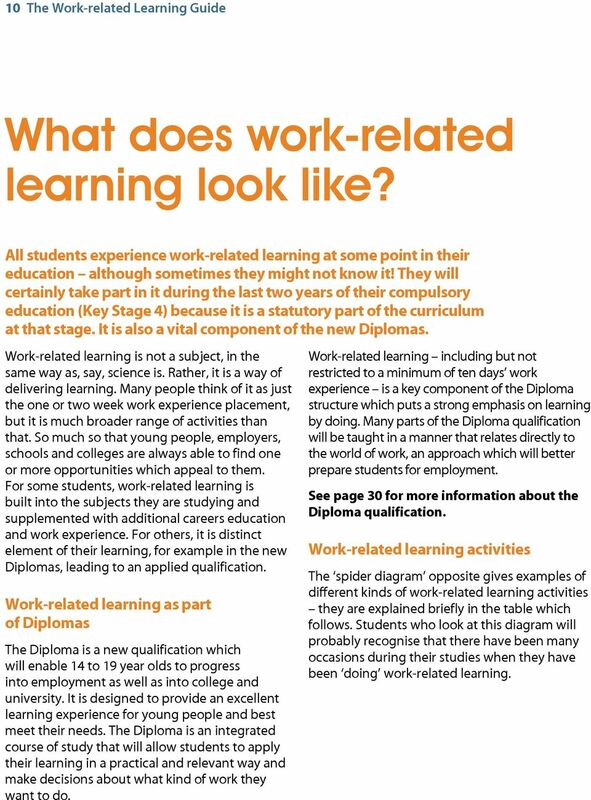 Work-related learning including but not restricted to a minimum of ten days work experience is a key component of the Diploma structure which puts a strong emphasis on learning by doing. Many parts of the Diploma qualification will be taught in a manner that relates directly to the world of work, an approach which will better prepare students for employment. See page 30 for more information about the Diploma qualification. Work-related learning activities The spider diagram opposite gives examples of different kinds of work-related learning activities they are explained briefly in the table which follows. Students who look at this diagram will probably recognise that there have been many occasions during their studies when they have been doing work-related learning. 12 12 The Work-related Learning Guide Examples of work-related learning activities (arranged in alphabetical order) Activity Careers information Curriculum-linked visits Enterprise education Industry days Mentoring Mock interviews Practical experience Part-time work Projects Tasters Work simulations or role plays Work experience Work shadowing Workshops Description Careers Education helps to develop the knowledge and skills needed to make successful choices, manage transitions in learning and move into work. Careers Guidance enables young people to use the knowledge and skills they have gained to make decisions about learning and work that are right for them. Student visits to work environments. Schools and colleges link with businesses to plan visits and agree learning outcomes. The information and experience gained from the visit is then incorporated into the students studies. A key element of the work-related learning framework, which aims to encourage young people to be more enterprising. One or more employers delivering sector-specific information to groups of learners on school, college or employer premises. People with industrial or commercial experience providing 1-to-1 encouragement and support to students or trainees. Simulated interviews by people who interview candidates as part of their job injects reality into job/placement searches. Short job-specific tasks and other hands-on experiences which provide opportunities for students to practice what they have learned in the classroom e.g. drafting a guide or interpreting a set of financial accounts and preparing a report. Increasing numbers of young people take part-time employment at age 16+ this provides opportunities to learn about taking responsibility, customer and cash handling and health and safety procedures as well as to gather evidence for building a portfolio, whether for A-levels in vocational subjects, key skills or general records of achievement. Students, individually or in teams, working on analysing and or solving business related problems. Taster sessions providing insights into the world of work usually in sector or industry-based workshops organised by employer forums or Education Business Partnership Organisations. Teams of students taking part in business games and work simulations to resolve complex business-related problems and using role playing, teamwork, decision-making and problem-solving skills. A placement with an employer in which a young person carries out a task or range of tasks and duties in much the same way as an employee with the emphasis on learning from the experience. Work experience provides opportunities for learning about the skills and personal qualities, careers, roles and structures that exist within a workplace or organisation. Work experience is a requirement of Diplomas. Learners observing others in real working environments, undertaking tasks and talking to staff to find out more about organisations. Employers lecturing and/or leading discussions with students on school, college or employer premises about the realities of the employment and training environment. 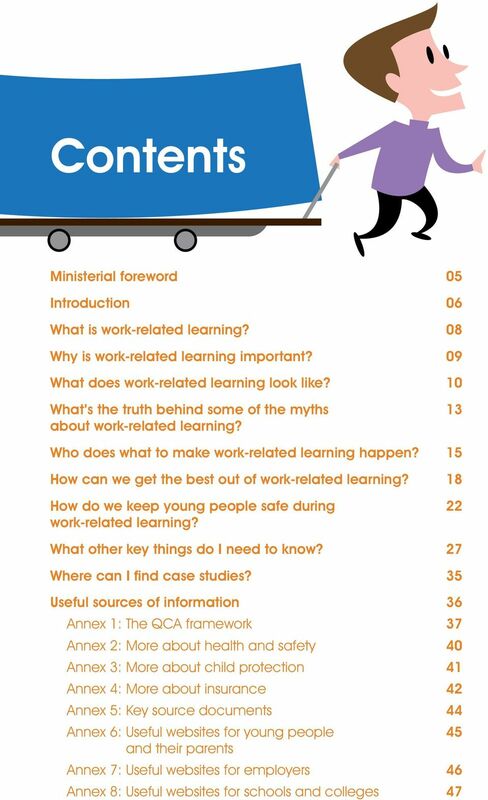 13 The Work-related Learning Guide 13 What s the truth behind some of the myths about work-related learning? The myth 1. Work-related learning doesn t do any good. 2. The statutory requirement at Key Stage 4 is for 2 weeks work experience. 3. Young people under 16 can t do placements in industry or some sectors for health and safety reasons. 4. Each member of an employer s staff who is involved in work experience has to have a CRB check. 5. Enterprise education is separate from work-related learning. 6. Young people with special or additional needs can t take part in work-related learning. 7. More employers are needed to provide work-related learning. The truth Yes it does. There s lots of very positive feedback from those who ve participated in it. For example, the CBI Report Time well spent referred to a 2006 survey of year-olds who had recently been on work experience. It said that over two-thirds of respondents agreed or strongly agreed that work experience had helped them to understand how learning at school is important in getting a job and that almost 80% agreed it had given them a good insight into the world of work. Not true. Work-related learning programmes provided by schools can include a wide range of activities. These programmes may link to the QCA framework on Economic wellbeing 11 19: career, work-related learning and enterprise (see Annex 1). A key element of the work-related learning framework, which aims to encourage young people to be more enterprising. No they don t. CRB checks are only needed in certain situations please see pages of this guide for more detailed information. Not true. Enterprise is part of work-related learning as well as an output from it. 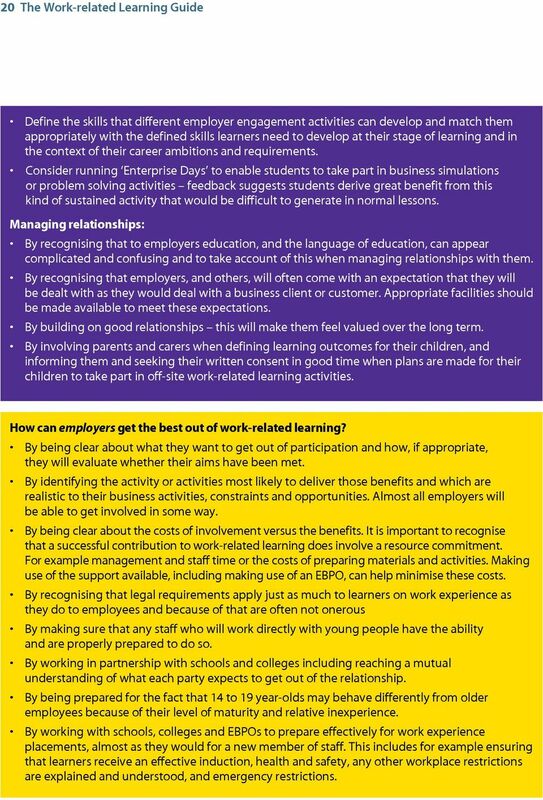 See section in Guide headed What is Enterprise Education and how does it fit with work-related learning? No. Young people with special or additional needs do take part in workrelated learning it happens all the time, all over the country and achieves some really positive results. It is well worth making the effort to help these young people to take part. Employers have reported that the experience transformed the workplace. Not true. Over 300,000 employers are currently involved in providing work-related learning and there is a strong focus on ensuring the quality and value added of the work-related learning already taking place. What is needed is a greater range and depth of employer involvement, especially to make a success of the new Diplomas. Employers who are interested should get in touch with their local Education Business Partnership Organisation. 14 14 The Work-related Learning Guide The myth 8. Work-related learning is very time consuming and onerous for employers. 9. We can t find employers to provide work-related learning in rural areas. The truth It doesn t need to be. There is a broad range of work-related learning options to help the development of young people. They can involve different kinds and levels of commitment employers who are interested in getting involved can choose which ones appeal to them most and support is available from Education Business Partnership Organisations to minimise any bureaucracy. Work-related learning is happening in rural areas. The issue is more about employers in rural areas being harder to find than it is about no employers. Almost all young people participate in work experience, including those in rural areas. 10. Insurance is expensive. That isn t necessarily the case as most employers will already have in place insurance policies that cover most risks arising from work experience and other visits, provided that the work experience is in accordance with the normal business practices of the employer (see the ABI guidance at Annex 4). 11. Getting involved is really difficult and there s no support available to help me. Not true. It s only difficult if you try to do it all by yourself. There is lots of help and support available (see Annexes 6 to 9). 15 The Work-related Learning Guide 15 Who does what to make work-related learning happen? 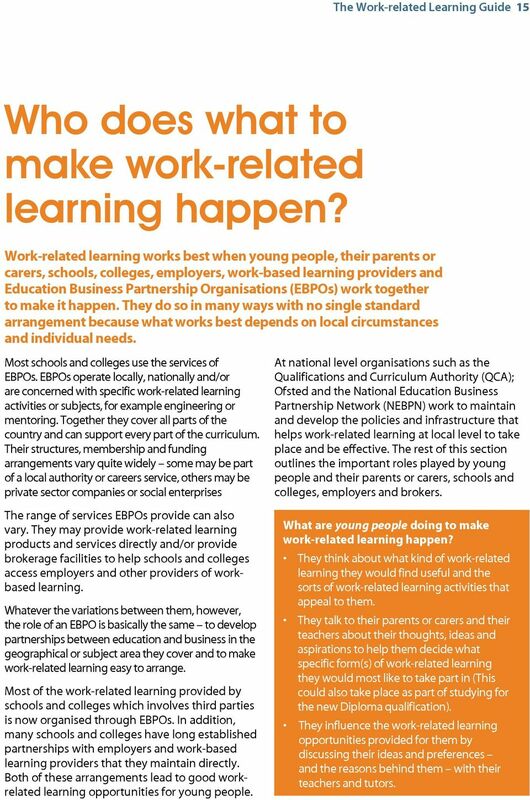 Work-related learning works best when young people, their parents or carers, schools, colleges, employers, work-based learning providers and Education Business Partnership Organisations (EBPOs) work together to make it happen. They do so in many ways with no single standard arrangement because what works best depends on local circumstances and individual needs. Most schools and colleges use the services of EBPOs. EBPOs operate locally, nationally and/or are concerned with specific work-related learning activities or subjects, for example engineering or mentoring. Together they cover all parts of the country and can support every part of the curriculum. Their structures, membership and funding arrangements vary quite widely some may be part of a local authority or careers service, others may be private sector companies or social enterprises The range of services EBPOs provide can also vary. They may provide work-related learning products and services directly and/or provide brokerage facilities to help schools and colleges access employers and other providers of workbased learning. Whatever the variations between them, however, the role of an EBPO is basically the same to develop partnerships between education and business in the geographical or subject area they cover and to make work-related learning easy to arrange. Most of the work-related learning provided by schools and colleges which involves third parties is now organised through EBPOs. In addition, many schools and colleges have long established partnerships with employers and work-based learning providers that they maintain directly. Both of these arrangements lead to good workrelated learning opportunities for young people. At national level organisations such as the Qualifications and Curriculum Authority (QCA); Ofsted and the National Education Business Partnership Network (NEBPN) work to maintain and develop the policies and infrastructure that helps work-related learning at local level to take place and be effective. The rest of this section outlines the important roles played by young people and their parents or carers, schools and colleges, employers and brokers. What are young people doing to make work-related learning happen? They think about what kind of work-related learning they would find useful and the sorts of work-related learning activities that appeal to them. They talk to their parents or carers and their teachers about their thoughts, ideas and aspirations to help them decide what specific form(s) of work-related learning they would most like to take part in (This could also take place as part of studying for the new Diploma qualification). They influence the work-related learning opportunities provided for them by discussing their ideas and preferences and the reasons behind them with their teachers and tutors. 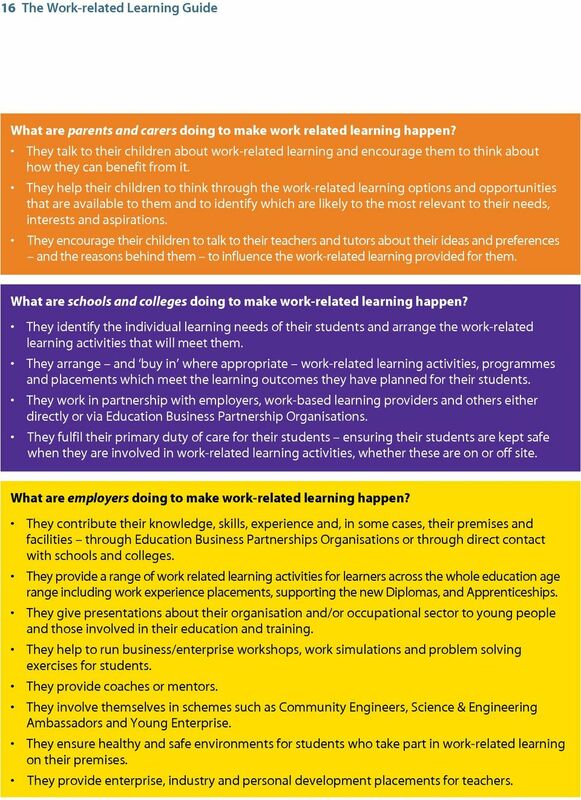 16 16 The Work-related Learning Guide What are parents and carers doing to make work related learning happen? They talk to their children about work-related learning and encourage them to think about how they can benefit from it. They help their children to think through the work-related learning options and opportunities that are available to them and to identify which are likely to the most relevant to their needs, interests and aspirations. They encourage their children to talk to their teachers and tutors about their ideas and preferences and the reasons behind them to influence the work-related learning provided for them. What are schools and colleges doing to make work-related learning happen? They identify the individual learning needs of their students and arrange the work-related learning activities that will meet them. They arrange and buy in where appropriate work-related learning activities, programmes and placements which meet the learning outcomes they have planned for their students. They work in partnership with employers, work-based learning providers and others either directly or via Education Business Partnership Organisations. They fulfil their primary duty of care for their students ensuring their students are kept safe when they are involved in work-related learning activities, whether these are on or off site. What are employers doing to make work-related learning happen? They contribute their knowledge, skills, experience and, in some cases, their premises and facilities through Education Business Partnerships Organisations or through direct contact with schools and colleges. They provide a range of work related learning activities for learners across the whole education age range including work experience placements, supporting the new Diplomas, and Apprenticeships. They give presentations about their organisation and/or occupational sector to young people and those involved in their education and training. They help to run business/enterprise workshops, work simulations and problem solving exercises for students. They provide coaches or mentors. They involve themselves in schemes such as Community Engineers, Science & Engineering Ambassadors and Young Enterprise. They ensure healthy and safe environments for students who take part in work-related learning on their premises. They provide enterprise, industry and personal development placements for teachers. 17 The Work-related Learning Guide 17 What are Education Business Partnership Organisations doing to make work-related learning happen? They work in partnership with schools, colleges, employers and work-based learning providers often in a particular geographical area raising awareness and providing, arranging and supporting work-related learning activities. They offer a range of services which, although varying between EBPOs, typically, include: helping employers to get involved in work-related learning in places and in ways that are right for the employer; establishing and maintaining partnerships between employers, schools, colleges and work-based learning providers matching needs, interests, aspirations and opportunities; maintaining databases of employers and work-based learning providers and the work-related learning opportunities they are able to provide carrying out health and safety checks and that other legal requirements are met, including insurance; arranging and brokering work-related learning activities including: - work experience placements with employers, carrying out health, safety and welfare visits; - mock employer interviews, including interview preparation and interview feedback sessions; - curriculum-linked industry visits; - employer talks; - careers events; - in-school and in-college business/enterprise workshops, work simulations and problem solving exercises run by employers for small groups of students; - vetted, trained and briefed volunteer mentors from local businesses; - projects that introduce young people (including those of primary school age) to business practices and help them acquire new skills whilst having fun, and - professional development placements for teachers. providing facilities increasingly on-line to make it easier for schools and colleges to find employers to work with them; monitoring and evaluating work-related learning schemes to identify the impact they are having and to improve and maintain their quality, and using their expertise to simplify matters for employers, schools and colleges and providing them with short-cuts to finding solutions for example, in relation to health and safety, child protection and CRB checks. 18 18 The Work-related Learning Guide How can we get the best out of work-related learning? This section builds on the previous one about who does what. It offers guidance, based on good practice, on the steps that schools, colleges, and employers can take to ensure they each get the most out the work-related learning activities they provide. 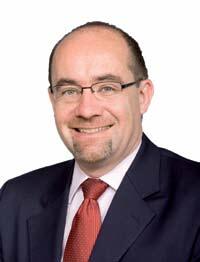 It also outlines ways in which Education Business Partnership Organisations can help them do so. The separate sub-sections contain guidance aimed at each of the groups identified, but they are all likely to be of interest to those who wish to understand more about the wider issues involved and about good practices that can help deliver further improvements. How can young people get the best out of work-related learning? By taking full advantage of opportunities to: participate in work-related learning that is relevant to their needs and circumstances; express their preferences to their teachers or tutors; discuss and agree individual learning outcomes, and review the extent to which those learning outcomes were achieved. By responding positively to the help and encouragement they receive from their school or college, employers and their parents or carers. By absorbing information provided during briefings and inductions and actively taking responsibility for getting maximum benefit from the work-related learning in which they participate. By acknowledging and understanding the importance of taking responsibility for their own actions in relation to the health, safety and welfare of themselves and others when taking part in work-related learning, particularly when on employers premises. By thinking about what they have learned, how it has benefited them and what further work-related learning would help them to move in the direction they would like to go. 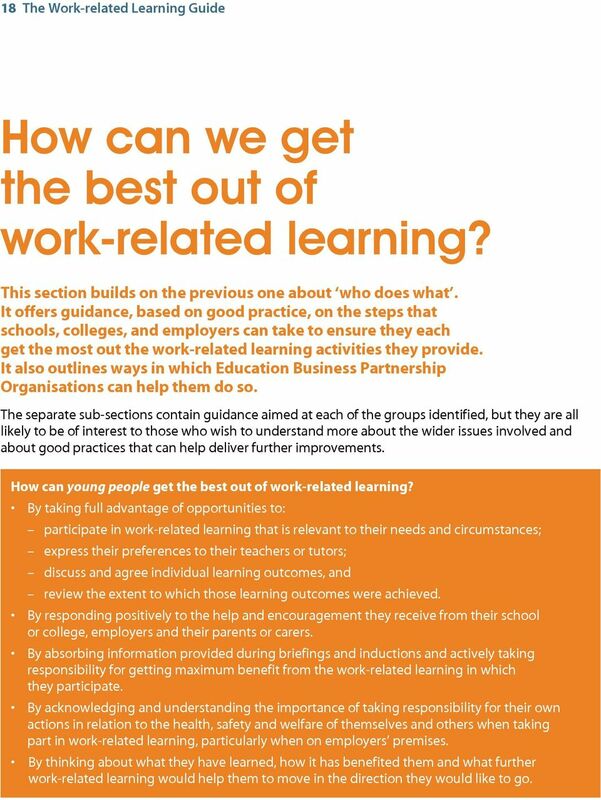 19 The Work-related Learning Guide 19 How can parents and carers help their children to get the best out of work-related learning? By actively encouraging them to: take full advantage of work-related opportunities open to them, and adopt a responsible attitude towards the health, safety and welfare of themselves and others. By providing relevant information to schools or colleges about any medical or behavioural conditions which have or may have implications for the kind of work-related learning opportunities that are appropriate for their children. By checking information provided by schools, colleges or placement organisers about work-related learning experiences that have been organised for their children and satisfying themselves that the arrangements are suitable and sufficient before giving any consent requested. By informing schools, colleges and or placement organisers of any actual or potential health and safety problems they may be aware of in premises where their children are engaged in work-related learning. By talking to their children about the work-related learning they have experienced to help them evaluate how they have benefited and to think about what further work-related learning would be appropriate. 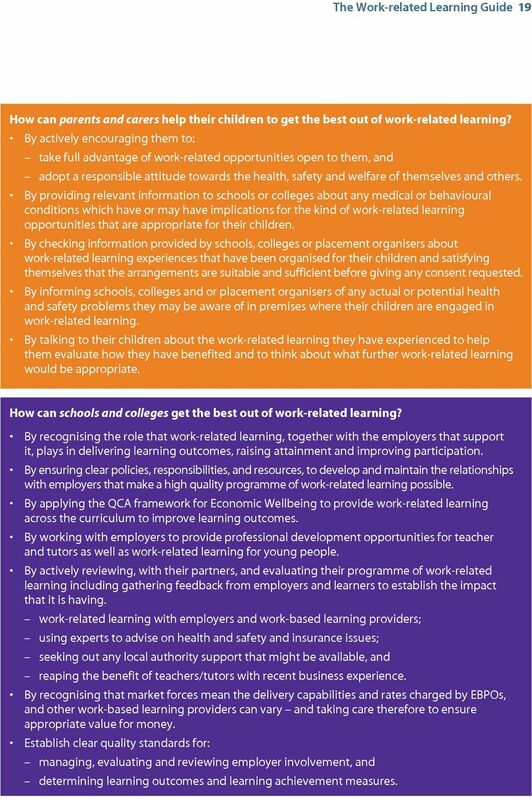 How can schools and colleges get the best out of work-related learning? 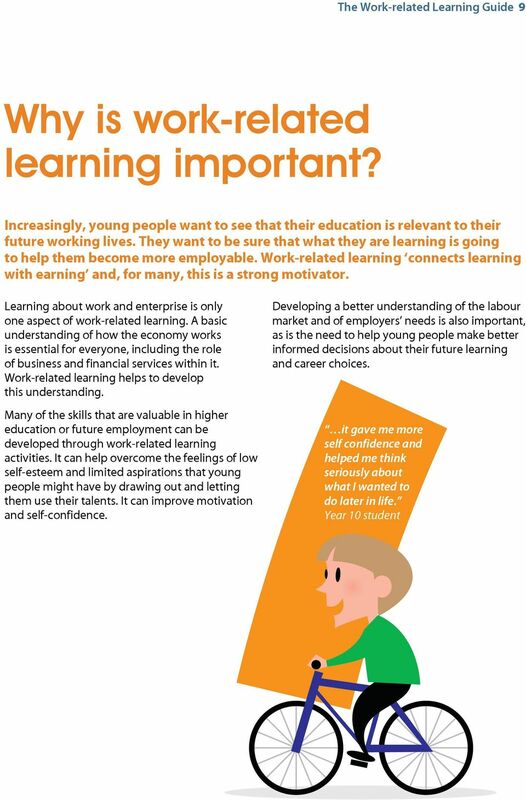 By recognising the role that work-related learning, together with the employers that support it, plays in delivering learning outcomes, raising attainment and improving participation. By ensuring clear policies, responsibilities, and resources, to develop and maintain the relationships with employers that make a high quality programme of work-related learning possible. By applying the QCA framework for Economic Wellbeing to provide work-related learning across the curriculum to improve learning outcomes. By working with employers to provide professional development opportunities for teacher and tutors as well as work-related learning for young people. By actively reviewing, with their partners, and evaluating their programme of work-related learning including gathering feedback from employers and learners to establish the impact that it is having. work-related learning with employers and work-based learning providers; using experts to advise on health and safety and insurance issues; seeking out any local authority support that might be available, and reaping the benefit of teachers/tutors with recent business experience. By recognising that market forces mean the delivery capabilities and rates charged by EBPOs, and other work-based learning providers can vary and taking care therefore to ensure appropriate value for money. Establish clear quality standards for: managing, evaluating and reviewing employer involvement, and determining learning outcomes and learning achievement measures. 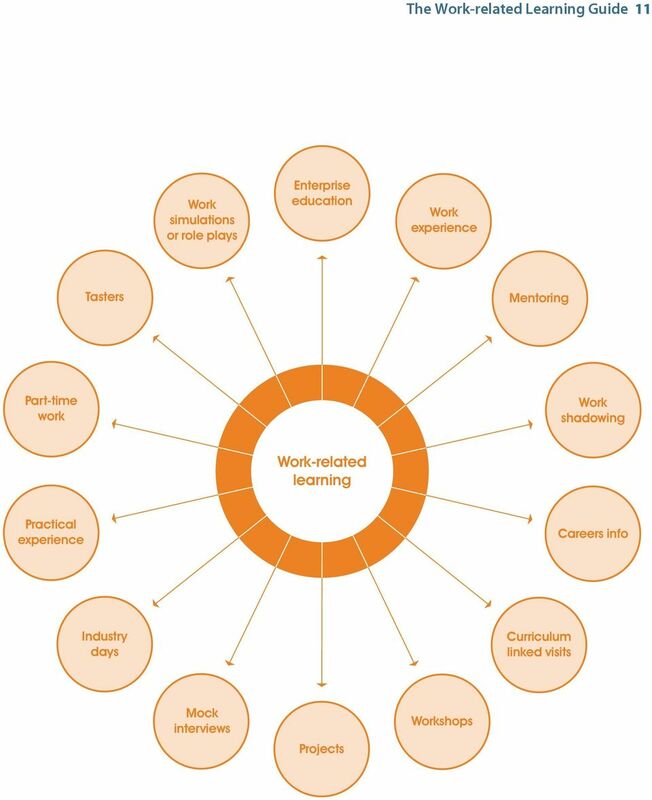 20 20 The Work-related Learning Guide Define the skills that different employer engagement activities can develop and match them appropriately with the defined skills learners need to develop at their stage of learning and in the context of their career ambitions and requirements. Consider running Enterprise Days to enable students to take part in business simulations or problem solving activities feedback suggests students derive great benefit from this kind of sustained activity that would be difficult to generate in normal lessons. Managing relationships: By recognising that to employers education, and the language of education, can appear complicated and confusing and to take account of this when managing relationships with them. By recognising that employers, and others, will often come with an expectation that they will be dealt with as they would deal with a business client or customer. Appropriate facilities should be made available to meet these expectations. By building on good relationships this will make them feel valued over the long term. By involving parents and carers when defining learning outcomes for their children, and informing them and seeking their written consent in good time when plans are made for their children to take part in off-site work-related learning activities. How can employers get the best out of work-related learning? By being clear about what they want to get out of participation and how, if appropriate, they will evaluate whether their aims have been met. By identifying the activity or activities most likely to deliver those benefits and which are realistic to their business activities, constraints and opportunities. Almost all employers will be able to get involved in some way. By being clear about the costs of involvement versus the benefits. It is important to recognise that a successful contribution to work-related learning does involve a resource commitment. For example management and staff time or the costs of preparing materials and activities. Making use of the support available, including making use of an EBPO, can help minimise these costs. By recognising that legal requirements apply just as much to learners on work experience as they do to employees and because of that are often not onerous By making sure that any staff who will work directly with young people have the ability and are properly prepared to do so. By working in partnership with schools and colleges including reaching a mutual understanding of what each party expects to get out of the relationship. By being prepared for the fact that 14 to 19 year-olds may behave differently from older employees because of their level of maturity and relative inexperience. By working with schools, colleges and EBPOs to prepare effectively for work experience placements, almost as they would for a new member of staff. This includes for example ensuring that learners receive an effective induction, health and safety, any other workplace restrictions are explained and understood, and emergency restrictions. South Somerset 14-19 Partnership Work Experience. Employers Handbook. Thank you for considering taking a learner on a Work Experience Placement. Childcare. Meeting your Childcare training needs. Real Benefits. Transform your Childcare Business through Training. 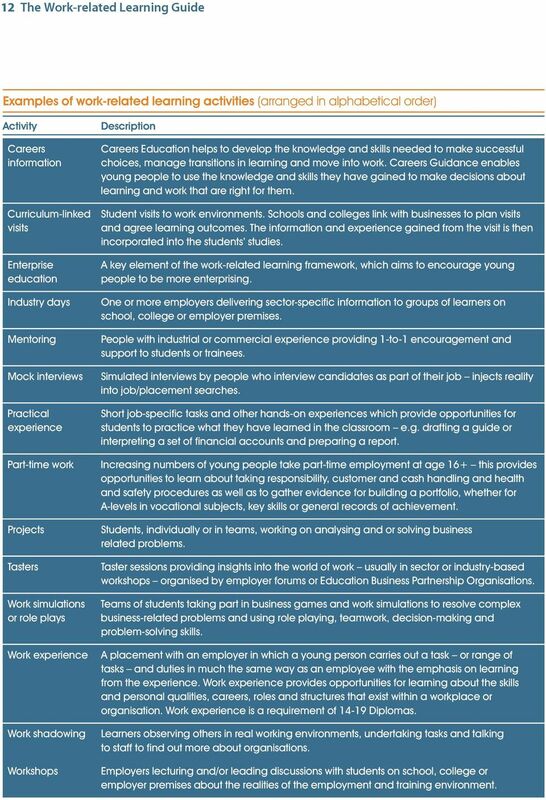 Survey of Career Education and Guidance in Schools and Links with Employers Career Development Institute (CDI) with Careers England. Mentor Portfolio of Evidence for Nurses: Recognition of Mentorship Skills, Guidance and Mapping Framework for Stage 3 mentors/practice Teachers. MARTONGATE PRIMARY SCHOOL SAFEGUARDING POLICIES INTRODUCTION Our safeguarding policies outline the ways in which we ensure the safety and well-being of the pupils who attend Martongate primary School.